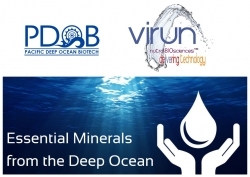 Virun, and Pacific Deep Ocean Biotech (PDOB), work together to provide mineral complexes that are derived from the ocean with Omega-3 EPA and DHA that deliver clean label claim and eco-friendly sustainable solutions. The combination allows a source for mineral complexes in VIRUN’s patent and patents-pending technologies that naturally yield low metal content to avoid reactivity with omega-3 EPA and DHA, all-the-while delivering a consistent level of Calcium, Sodium, Potassium and Magnesium. There has been a growing need to incorporate naturally sourced minerals into foods, beverages and supplements. To meet this need, VIRUN® NutraBIOSciences™ has sought to incorporate mineral complexes into its concentrates, powders and finished products. The combination of mineral solutions with Omega-3 EPA and DHA can be complex. Naturally derived mineral complexes can come paired with high levels of iron, or other metals, that can accelerate oxidation of Omega-3 EPA and DHA. To solve this, PDOB presented VIRUN with their Deep Ocean Mineral Complex, which contains no metal activity in connection with VIRUN’s OmegaH2O® patent and patent pending technologies and compositions. VIRUN and PDOB conducted stability testing on several 16oz beverage applications, and concluded that applications containing Omega-3 EPA and DHA and 25% PDOB Deep Ocean Mineral Complex remain stable for at least year. Liquid applications, such as beverages and shot-like supplements, are best formulated using the most water soluble ingredients available. Minerals, for example Calcium Citrate or Magnesium HCl, can sometimes be challenging in liquid applications, as sediment may appear in clear water beverages at higher concentrates. Using PDOB’s natural mineral complexes derived from the ocean allows a “clear” solution for beverages and versatility in formulation. We are a Nutra-BioSciences™ company formed in 2003, headquartered in Walnut, CA, with an emphasis on safe and effective delivery technology for pharmaceuticals, dietary supplements, foods and beverages. Our aim is to focus on delivery both to the human body, via improving the efficacy of nutrients utilizing our patent and patents pending technologies. VIRUN’s pharmaceutical and dietary supplement technologies allow improved bioavailability through nanotechnology and Transferrin conjugation that target specific cells within the body. VIRUN’s Esolv™ and DPtechnology™ allow water-insoluble nutrients to be clear, water-soluble and stable in food, beverage and supplements. VIRUN’s innovative solutions and brands include Omega-3 EPA DHA branded as OmegaH2O®, Resveratrol, CoQ10 branded as CoenzymeClear™, Astaxanthin branded as AstaxH2O™, PQQ branded as PQQwater™, Lutein, Phytosterols and Curcumin. Virun is a fully integrated research and production facility with manufacturing in CA and finished product processing in FL. For the last 10 years, the Directors of PDOB (Pacific Deep Ocean Biotech Co.) have been developing a new source of mineral nutrition from the deep ocean waters at the East Coast of Taiwan where it is uniquely possible to access from the shoreline. PDOB supplies standardized and customized deep ocean mineral compounds for the beverage and nutritional supplement industry supported by clinical research. Our team has upgraded the concentration process to produce a pure mineral and trace element concentrate (Liquid) that can be easily absorbed by the human body. PDOB has also developed a Deep Ocean Minerals Powder that can be formulated into heath supplement products. Our products are standardized on Magnesium and contain over 70 different minerals and trace elements. PDOB’s Deep Ocean Mineral Complexes are supported by published scientific studies. The main applications for beverage are associated with fatigue relief and accelerated recovery after physical challenge. This has ideal synergy with the VIRUN ingredients, especially the OmegaH2O products. PDOB has its head office in Taipei, International Office in Germany and manufacturing facilities on the east coast of Taiwan. Our mineral solutions are certified ISO, HACCP, Kosher, and Halal. VIRUN formulates ingredients that emphasize specific health claims toward cognitive health.